It was a law of the Republic that on the day of the Holy Redeemer (the third Saturday in July of each year) the temple sacred to Him should be visited by the Doge and the Signoria. Even today, on that day, Venice is joined to the Giudecca by a bridge of boats, and the eve of the festival is celebrated with illuminations, dinners and other festivities. Long ago, near where the church of S. Maria della Salute stands, there was a church and a monastery dedicated to the Holy Trinity, which in 1256 the Republic gave to the Teutonic Knights in return for their assistance against the Genoese. The Venetian priory of the Knights being suppressed in 1592 by Pope Clement VIII, the buildings were assigned to the Patriarchate of Venice for the foundation of a religious seminary which was already installed in the Cloister of St. Cyprian of Murano. 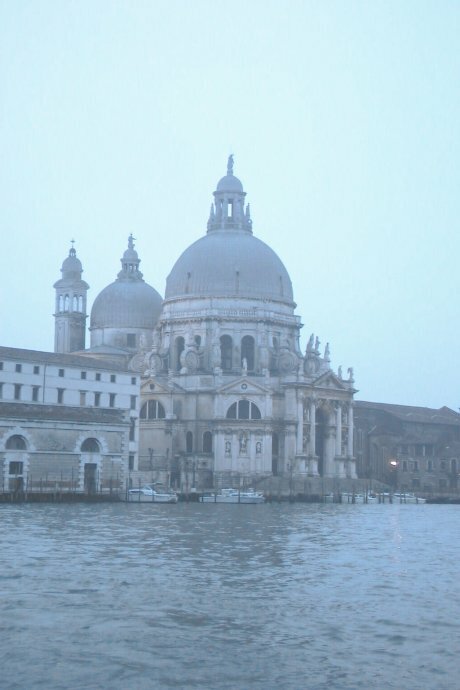 The clerics remained in their new hospice until 1630, when another pestilence raged through the city and the Senate vowed to build a temple to S. Maria della Salute (health) to free her from the scourge. The sickness passed in 1631 and they fulfilled their promise by building a large wooden church. Then, demolishing the monastery and church of the Holy Trinity and moving the clerics back to Murano, the magnificent church we see today was built to a design by Longhena. While the work was going on, in 1656 the Senate decreed that it should be given to the regular clergy of the congregation of Somasca, who built a convent alongside the church to another design by Longhena. This was completed in 1672, at the same time as the church. The volutes, the large dome, the pillars, the tympani, the statues and the stairs make the outside of the the basilica a spectacular sight. The interior is octagonal with robust arches at the sides divided by columns, on which rest the frame and tambour of the dome. There is a profusion of notable works of painting and sculpture. La Salute is also a popular festival, celebrated each year on the 21st of November in homage to the Virgin who put an end to the pestilence.